« A Brand New Western Adventure You’ll Love From Charles Ray: Jacob Blade: Vigilante! For the first time! 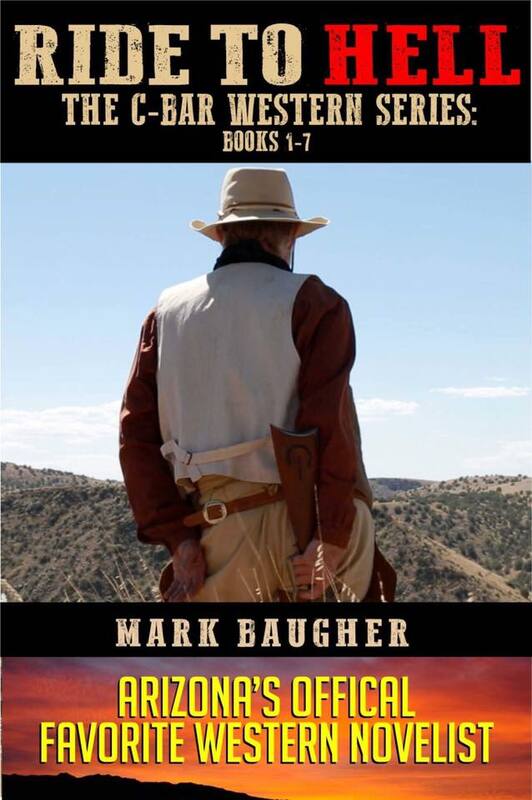 The complete series from Arizona’s most popular Western author Mark Baugher! The whisperin’, shiftin sands, the beating hot sun… the cowboy struggling to make his way through the arid desert. A man with a mission. A man with a gun. A man without a star. These are the seven adventures that make up the popular “C-Bar” series, a brand-new series of Western adventures from top Western seller Mark Baugher. Filled to the brim with action, adventure, plot twists and gunsight justice—Dockie is not a man to be crossed. These are Western adventures filled with the dead, the dying and those who don’t get in his way—because those who do cross Dockie, end up dead. Real dead. C-Bar Volume 4 is told by Chris, the nephew of that tough old pioneer named Dockie Barnett, owner of the C-Bar Ranch. Chris was a city slicker attorney when he first came to visit his Uncle Dockie and Aunt Marsha, but he became one of the C-Bar Ranch family and a real cowboy. These are the Western adventures you won’t want to miss. If you like your Westerns written in the style of Robert Hanlon, C. Wayne Winkle and Paul L. Thompson, you will love the seven full length western novels that make up the “C-Bar” series. Download your copy of this great collection today, and start a read filled with action, adventure and drama—and the hopes and dreams of the American West. Grab your copy for 99 cents by clicking here!